What prey tell is this? This is my ticket to freedom. Freedom from nagging, hassling and wasting my energy trying to get my child to take responsibility for himself. This represents years of planning, redesigning and ultimately success. As you can see, this to do list has been well used. This version is over 3 years old and my 14 year old child still uses it to this day. My child has ADHD. The “Absent Minded Professor” moniker suits him well. Anything complex is very simple for him. It is the simple things that trip him up. He needs daily reminders and this to do list does just that. We’ve had many failures and have had to go back to the drawing board. For instance, just having “put my shoes on” was not enough. I needed to add “which are tied” because the littlest things escape him. When he was new to the list, I would tell him “go work your list.” It really was as much for me as it was for him. The mornings stopped being so crazy and stressful. I knew he could take responsibility for himself and I think the list provided him the structure and reminders he needed. Initially I posted it on his wall. But then I found that he actually was carrying it around and using it as a visual reminder. Many lists were lost or destroyed. When things were particularly bad, I had him write his lists hoping he would commit them to memory. Ultimately, I ended up laminating the list with morning and evening instructions on opposing sides. When he was younger I punched a hole in the center and put it on a name badge holder he could wear around his neck. He found this mildly embarrassing so he worked extra hard to prove it was unnecessary. These lists have been lifesavers for our family. My son has grown and matured and is able to take care of his basic needs. 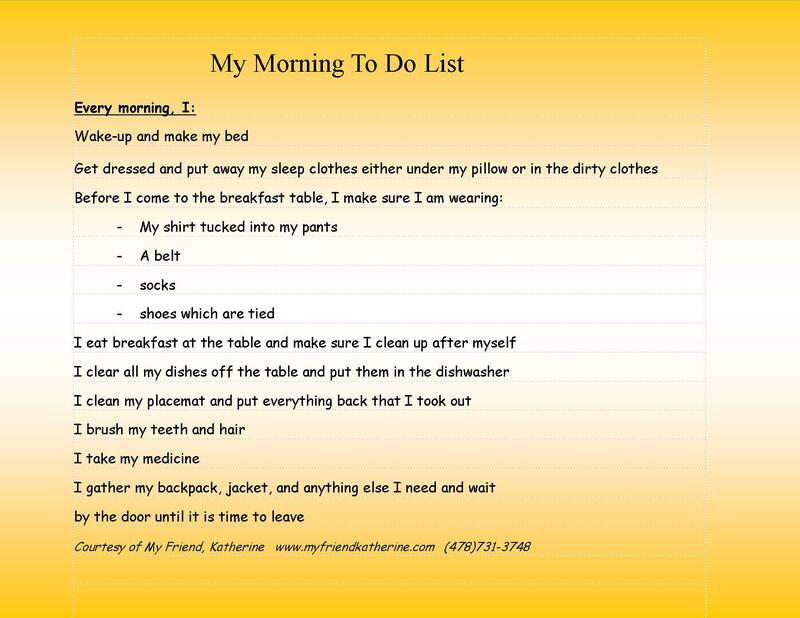 And I do not get upset with constantly having to remind or nag him to do these basic everyday tasks. 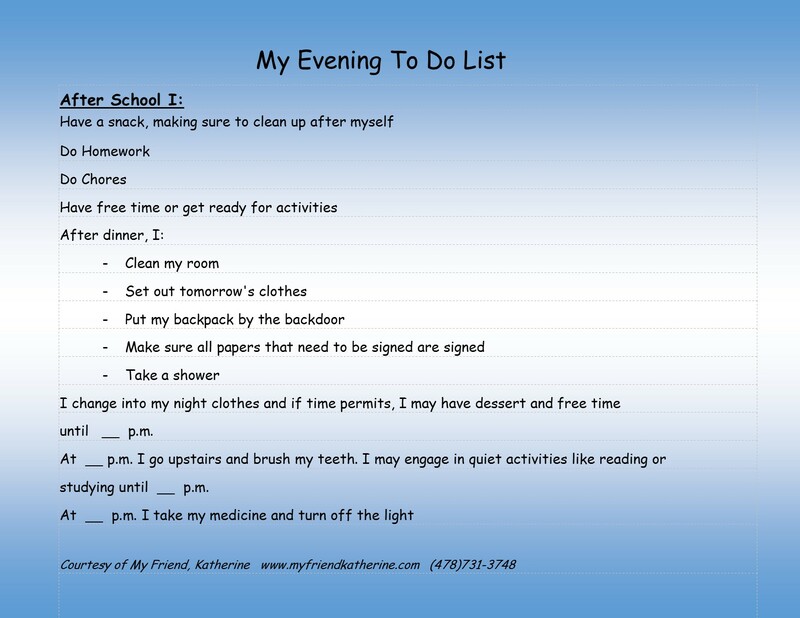 These lists help me conserve my energy for more productive goals like nurturing his self-esteem and his hopes and dreams. 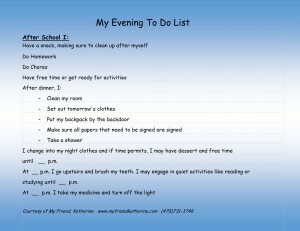 Here is an editable version for you to customize for you and your child. When I gave my son the list, everything changed. Instead of depending on me to figure it out for him, he depended on the list. In time he learned he could depend on himself. And that lesson might be the most enduring part of this effort. Here’s to calm mornings and responsible children!